I'm currently running the gauntlet of Google instructions regarding authorship for another site. But it occurs to me that it would be lovely to have here too. to my Google+ URL in the Wizzley settings to see if that covers it. Have I read that correctly and done what's needful? If not, then can Simon add the requisite code to Wizzley, so that when authors Google plus their own content, it identifies them as authors? Or should we be adding something ourselves - perhaps in the body of our articles - to identify our own authorship? Naturally, all of the above rests upon us being convinced that alerting Google to our article's authorship is worth the hassle. Is it? 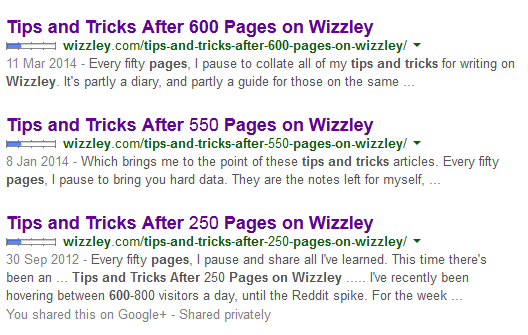 I set up my google authorship here in February. It's really made my search engine traffic pick up I think. im not really sure if you're asking how to do it, or if you want wizzley to do something, but this page is what I used to show me how to do it. The ?rel=author tag stuff is all set up already. Chefkeem thank you for making that quite painless. Jo I think that it's very important to let Google know who we are and where and what we write. That's why I made the decision to use my real name and photo. Somehow I hope it gives us more credibility with Google and therefore better rankings. I'm also hoping it gives us some protection against the miscreants who steal our content. Ah! Thank you all. I've checked and it seems that I'd already got this stuff set up. I must have done it sometime in the dark, distant past. Job's done? And it's important for all the reasons stated by Nelda and in the guide accessed via Abby's link. Sounds like I'm already ahead of the game. How do I check that it's all working as it should be? I can't see my fissog beside any of these links in the Google SERPs. Or am I missing the point again? Ah! Yes! That's working perfectly then!